You’re fed up with brown spots on your skin aging you and marring your complexion. Once you’ve reached a place of frustration, it’s time to take a step toward clear skin and confidence. But what’s the right path? 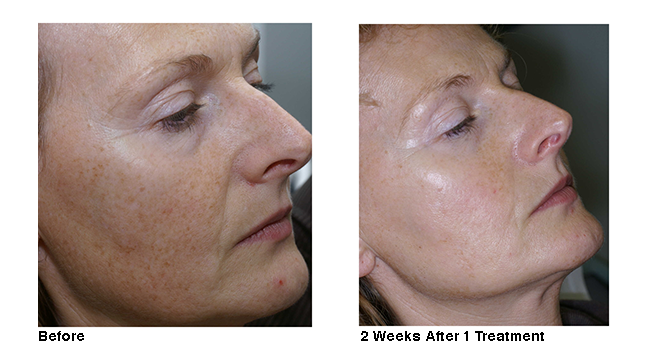 How Do IPL Treatments Work? Before getting started with IPL treatments, you will meet with one of our talented estheticians. During this conversation, we will examine your skin and decide on the appropriate course of action. We prioritize patient needs – your treatment will be based on your own skin and the treatment process with which you are most comfortable. Prior to treatment, cooling gel will be applied to the skin. You will also be given dark goggles to wear to protect your eyes from the light. Our Cutera LimeLight Facial™ has multiple settings that cater to individual skin types, as well as brown vs. red spots. Your aesthetician will adjust the handpiece to match your needs. During treatment, the skin is exposed to brief pulses of light. This light energy reaches the dermis, heating excessive pigmentation. Treatment will give you a mild stinging sensation, which many patients liken to a rubber band being snapped against the skin. The cooling gel will help with any discomfort. Your treatment session will be over in less than one hour. Since IPL treatments are non-ablative, the surface of the skin isn’t damaged, and there is almost no downtime. While there will be some redness after treatment, simply wearing makeup will cover that and allow you to go about daily activities without self-consciousness. You can get answers to more of your questions about the LimeLight Facial™ online, or get in touch to schedule a Wheaton brown spot removal consultation. Am I a Candidate? Schedule a Complimentary Brown Spot Removal Consultation.